Rakim is an American rapper. One half of golden age hip hop duo Eric B. & Rakim, he is widely regarded as one of the most influential and most skilled MCs of all time.Although his solo albums received lackluster response in comparison to his first albums with Eric B.
Eric B. & Rakim’s album Paid in Full was named the greatest hip hop album of all time by MTV in 2006, while Rakim himself was ranked #4 on MTV’s list of the Greatest MCs of All Time. 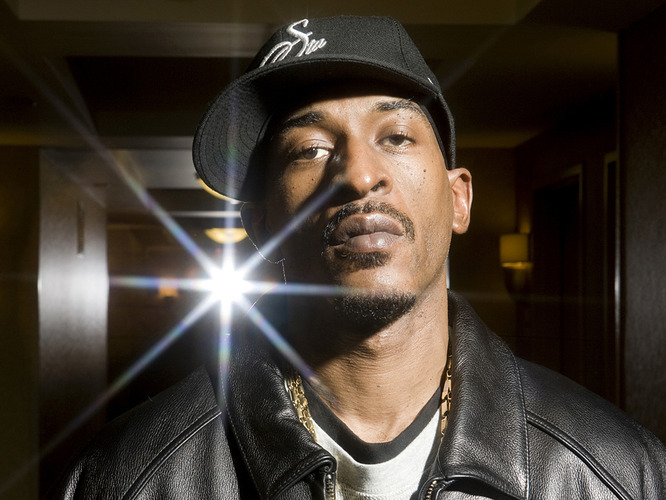 Steve Huey of AllMusic stated that “Rakim is near-universally acknowledged as one of the greatest MCs – perhaps the greatest – of all time within the hip-hop community.” The editors of About.com ranked him #2 on their list of the ‘Top 50 MCs of Our Time (1987–2007)’. Rakim began his career as the emcee of the rap duo Eric B. & Rakim, who in 2011 were nominated for induction into the Rock and Roll Hall of Fame. In 2012, The Source ranked him #1 on their list of the ‘Top 50 Lyricists of All Time’. Paid in Full was released during the period in hip hop that became known as the golden age hip hop era. Alex Ogg considered it the duo’s magnum opus in his book The Men Behind Def Jam. Rakim’s rapping set a blueprint for future rappers and helped secure East Coast hip hop’s reputation for innovative lyrical technique. William Jelani Cobb stated in his book To the Break of Dawn that his rapping had “stepped outside” of the preceding era of old school hip hop and that while the vocabulary and lyrical dexterity of newer rappers had improved, it was “nowhere near what Rakim introduced to the genre”. The New York Times’ Dimitri Ehrlich, who described the album as “an artistic and commercial benchmark”, credited Rakim for helping “give birth to a musical genre” and leading “a quiet musical revolution, introducing a soft-spoken rapping style”. Allmusic’s Steve Huey declared Paid in Full one of hip hop’s most influential albums and “essential listening” for those interested in the genre’s “basic musical foundations”. MTV ranked it at number one in “The Greatest Hip-Hop Albums of All Time”, stating it raised the standards of hip hop “both sonically and poetically” and described it as “captivating, profound, innovative and instantly influential”. The album is broken down track-by-track by Rakim in Brian Coleman’s book Check the Technique. Rolling Stone magazine listed it at number 227 on “The 500 Greatest Albums of All Time”, calling it “Ice-grilled, laid-back, diamond-sharp: Rakim is a front-runner in the race for Best Rapper Ever, and this album is a big reason why.” Similarly, Blender magazine included the album in its “500 CDs You Must Own Before You Die”. Time magazine listed it as one of the eighteen albums of the 1980s in its “All-TIME 100” albums; editor Alan Light acknowledged the record for changing the “sound, flow, and potential” of hip hop and that if Rakim is “the greatest MC of all time, as many argue, this album is the evidence”. Jess Harvell of Pitchfork complimented Rakim for an “endless display of pure skill” and described the album as “laidback and funky”, but believed it contained “too much filler to get a free ‘classic’ pass”. Pitchfork placed Paid in Full at number fifty-two in its “Top 100 Albums of the 1980s”; editor Sam Chennault wrote that Rakim inspired a generation of MCs and “defined what it meant to be a hip-hop lyricist”. The rappers who have used the unique rapping style employed by Rakim and attribute it as inspiration include GZA, Ghostface Killah, and Raekwon (from the Wu-Tang Clan), Tupac, Nas, Kool G. Rap, Jay-Z, The Notorious B.I.G., Eminem, 50 Cent, and many more. On July 11, 1995, the Recording Industry Association of America (RIAA) certified the album platinum. As of December 1997, it has sold over a million copies.